As always, check the Calendar of Events (pp. 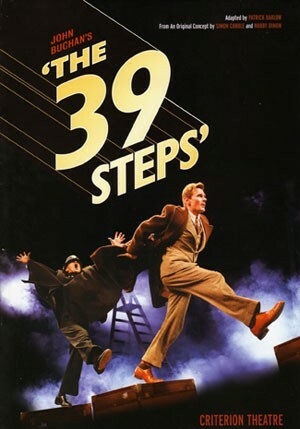 50-51 in the current issue, "Taxi Cab Confessions”) for even more theater listings — and for photos and a preview of The 39 Steps, visit "Stage Thrust." "A little bit of James Bond, a little bit of Masterpiece Theatre, and a lot of Monty Python" — that's how director William Marlowe describes this farcical Hitchcock spoof performed by just four actors (who'll change props and costumes in full view of the audience). Thurs-Sat at 7:30 pm; Sun at 2 pm. Tickets: $15-$21. Visit interplayers.com or call 455-PLAY. Buddy Holly's music is full of exuberance — and Brian Gunn's performance does it proud — but it gains even more when it appears in context: his early defiance of record producers, his last night with Maria Elena, etc. The musical continues at Spokane Civic Theatre on Thurs-Sat at 7:30 pm and Sun at 2 pm. Tickets: $28 (top); $10, student rush. She's ill. She won't be here on Friday night after all. If you didn't order online or by phone, call (800) 325-SEAT for refunds. The kid wants to be a pirate, but he also wants Mommy. This musical version, produced by Spokane Children's Theatre, will mimic the look of Melissa Long's picture book. Performances this Sat-Sun, Oct. 16-17, at both 1 pm and 4 pm at a new location for SCT: the Masonic Center, 1108 W. Riverside Ave. Tickets: $12; $10, kids. Continues through Oct. 24. Rick Hornor directs the musical that pits the winning Princess Winnifred versus the aggravating Queen Aggravaine at Whitworth's Cowles Auditorium on Fri-Sat at 8 pm and Sun at 2 pm; final performances the following weekend, on Oct 22-23. Tickets: $6-$8. Call 777-3707. The all-ages Friday night shows continue at 8 pm, with the more adult-themed Saturday shows at 9 pm — all for the price of a movie. There's just something electric about knowing that a half-dozen quick-witted folks are making up the comedy right in front of your eyes. Twelve years ago this month, Matthew Shepard was tortured and murdered for being gay. North Idaho College's free production will be performed inside Boswell Hall on Oct. 21-23 and Oct. 28-30 at 7:30 pm. Call (208) 769-3220. Few plays are better about urging all of us to face up to the truth. (It's not comforting, but it's bracing.) Richard Burton and Elizabeth Taylor drunkenly screamed at each other in the movie — but during this readers theater production at Lake City Playhouse, you can hear all the yelling from up close. Fri-Sat at 7:30 pm; $10. Call (208) 667-1323. LUNCHES AND PUNCHES 5: Guess this week's victim! LUNCHES AND PUNCHES 5: See the potato plummet!